In this photo taken on Dec. 21, 2014, a Royal Bengal Tiger pauses as it walks through a jungle clearing in Kaziranga National Park. Dane Huckelbridge’s latest book is No Beast So Fierce: The Terrifying True Story of the Champawat Tiger, the Deadliest Animal in History. Our fascination with tigers means that any new developments in their status tend to garner headlines – and 2018 was a year in which these majestic animals earned plenty of ink. In September, researchers in Nepal announced that the population of wild tigers in that country had almost doubled since the last count in 2009. Then, in October, genetic scientists finally laid to rest a long-standing debate about the number of tiger subspecies worldwide; after extensive testing of the various population’s genomes, the scientists in question announced that there are in fact six extant tiger species (three additional subspecies have already been lost to extinction). And just this past November, in a less cheery development, one man-eating tiger in India grabbed headlines worldwide when it was finally stopped by a hunter and, oddly enough, a bottle of Obsession cologne; evidently, tigers are attracted to the traces of civet glands it contains. Perhaps the most seemingly upbeat piece of tiger-related news, however, will come in the next few weeks, when the government of India – home to the largest population of wild tigers in the world – releases the results of its 2018 tiger census. Early indications point toward significant growth since the last national tiger census in 2014, when the government put the count at 2,226. 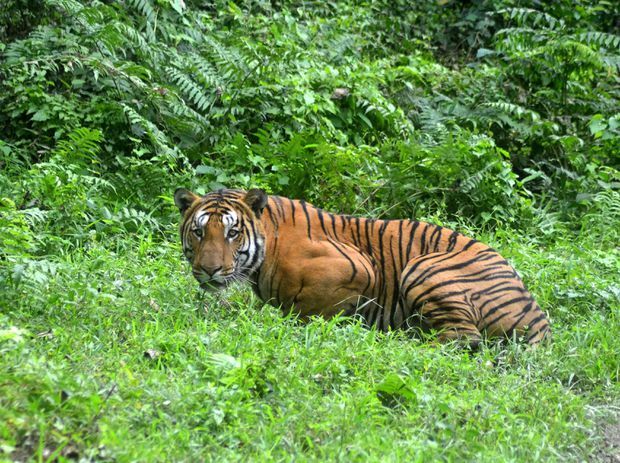 For an endangered animal such as the Bengal tiger, this would indeed be encouraging news – evidence that a population that had stood somewhere in the vicinity of 80,000 at the turn of the 20th century in India, only to be pushed to near-extinction a few decades later, is finally turning the corner. It is certainly a feel-good story to have such a majestic animal, a veritable symbol of India, come roaring back from the brink. However, it is important that good news such as this doesn’t overshadow a starker reality: Without ensuring the proper habitat to sustain such growth, the results of a quickly burgeoning tiger population can be problematic, if not disastrous. And as history has shown, having large numbers of apex predators crammed into isolated patches of shrinking habitat can have some very negative, and very deadly, consequences. There are plenty of examples of what can happen when a population of apex predators exceeds the amount of wild habitat and prey that is available to them, and when human populations begin encroaching on their domain. The Beast of the Gévaudan was a wolf that killed more than a hundred French peasants in the 1760s, a time when the forests of France were being rapidly cleared to make room for pastoral and agricultural expansion. The infamous Jersey Shore attacks of 1916 that claimed four lives in less than two weeks were committed by a shark at a time when commercial fishing was draining U.S. coastal waters of large prey fish, and the novelty of seaside recreation was putting disproportionately large numbers of humans into the shark’s hunting grounds. The most relevant example, however, as to the hazards posed by encouraging the growth of the Indian tiger population without expanding adequate habitat alongside it, is another case from India. In the region of Kumaon, a tiger known as the Man-eater of Champawat was reported to have killed and eaten 436 people between roughly 1900 and 1907. While it is not possible to confirm the exact number, journals, local accounts, and British colonial records of the day make clear that the Champawat tiger ate an extraordinarily large number of people, most of whom were collecting firewood or animal fodder on the forest’s edge when attacked. And while a jaw injury caused by a poacher’s bullet is often cited as the reason it abandoned its normal, large-bodied wild prey and began hunting our much more fragile species, a more detailed historical examination reveals that the Champawat tiger came of age in an era when there were a number of depredations to tigers’ habitat. British authorities were clearing out the forests for railway timber, the Nepalese government was destroying the marshy habitat of the lowlands to increase grain revenues and foreign livestock diseases spread by British cattle stations were wiping out the region’s populations of boar and deer – the animals upon which healthy tigers normally feed. The Champawat man-eater was eventually shot dead by the famous hunter Jim Corbett, but its demise seemed only to usher in a new era of man-eating tigers and leopards in the area – all of which would have suffered from the same lack of habitat and prey species as the Champawat tiger before them. The instances of man-eating predators in Kumaon seemed to more or less stop only when the population of wild tigers became so low in the mid-20th century – due directly to habitat destruction and overhunting – that there simply were no tigers left to lash out, with the few that remained being confined to the scattered reserves that dotted the country. And it is from that environmental calamity that the population of wild tigers in India is only now beginning to recover. The point of mentioning a story as horrific as that of the Champawat tiger isn’t to dampen the excitement of actual population growth for a crucial apex predator species that only recently was teetering on the brink of extinction. It is, rather, to reaffirm the idea that their habitat needs to be brought back from the brink as well. Tigers are incredibly territorial animals and require large amounts of viable, prey-rich forest in order for them to live the solitary, elusive existence in which Panthera tigris tigris is meant to live. If a rapidly growing population of wild tigers does not have the appropriate amount of forest and grassland to sustain it, what will occur is an increase in livestock killings and a rapid escalation of human-tiger conflict, as these deep-forest predators are instead forced to live on the outskirts of towns and in the wooded edges of farmland. There have been some promising initiatives to meet this challenge, such as the World Wildlife Federation’s Terai Arc Landscape program, which seeks to re-wild corridors between isolated tiger reserves to recreate a contiguous tiger-friendly habitat, and work to help local farmers serve as responsible stewards of the land. However, if tigers are to truly make a comeback in India – indeed, in Asia as a whole – then broader environmental actions will be necessary to ensure that problems related to human-tiger conflict are being solved, rather than created, and that such a hopeful renaissance for such a critical species isn’t stymied before it’s even truly begun.